This month, we’ll discuss goma, or sesame seeds. My fascination with sesame seeds started before my arrival to Japan. I lived in Andalucia, Spain for several years before moving to Japan and the Moorish (North African) influence had left its imprints on the area in the form of delicious Moroccan sweets that typically included sesame seeds. Japanese cuisine uses sesame seeds in everything from salads, rice toppings, salad dressing, bento dishes and even desserts. It is even a common condiment found on most dinner tables. It can be sprinkled over top of a dish or ground up and added to the dish. Interesting fact: Japan does not produce any sesame seeds but is one of the largest importers of sesame seeds. The Japanese use white and black sesame seeds. Since Japanese like to “eat” with their eyes as much as their stomach, sesame seeds are very important in creating contrast in their dishes. For example, using black sesame seeds to garnish light-colored dishes such as fish and light sesame seeds to garnish darker dishes. Suribachi is a great tool for grinding up sesame seeds. Swirl in a circular direction to grind. If you’re traveling to Japan, consider purchasing a suribachi, Japanese mortar and pestle as a functional souvenir. You can find suribachis in many locations in Japan from 100 Yen stores and home stores to the kitchen district, Kappabashi. The price difference is based on quality and design but makes a huge difference when making the following recipes. First, toast the sesame seeds then dump them into the suribachi and swirl until you smell a strong sesame flavor. Enjoy the following recipes. These are some of my favorites! 1. Combine all the ingredients for the dressing, mixing well. 2. Serve over mixed greens, cabbage, or thinly sliced vegetables. It can also be served as a dip for crudités. Note: The dressing can be kept in the fridge for 2-3 days. This recipe came from a cooking class I took in Kyoto several years ago. It’s one I keep going back to. Hamo is a local summer fish to Kyoto but I have used unagi (eel with sweetened sauce) or bacon. Or omit all together and it’s still a wonderful summer side dish. 1. Thinly slice cucumbers and soak in 1 cup water with ½ tsp salt for 5 minutes. After 5 minutes, squeeze the cucumbers to release extra water. 2. 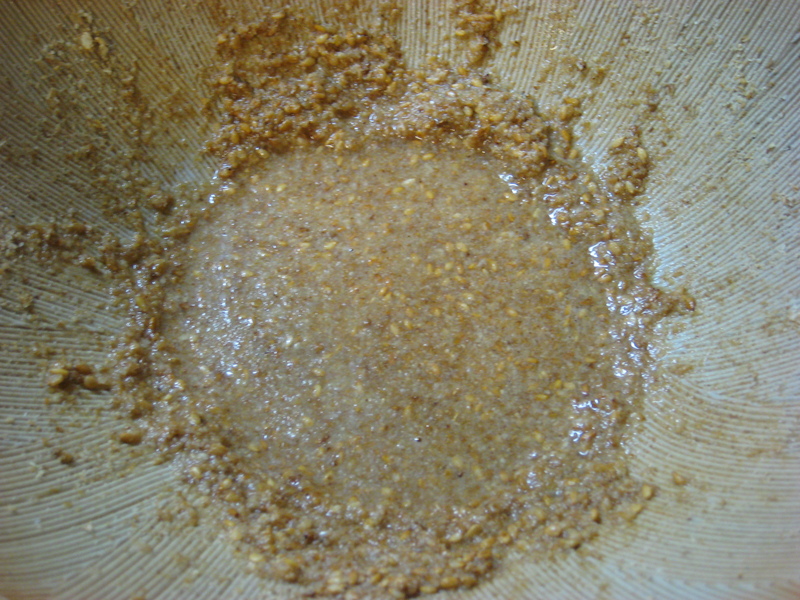 Prepare awasezu mixture in a small bowl. Cut hamo into bite-size chunks. Grate ginger finely keeping the juice but discarding the rest. 3. Grind sesame seeds in a bowl and combine awasezu and ginger juice. Put squeezed cucumber in it. Add hamo. 4. Serve it in a small dish. 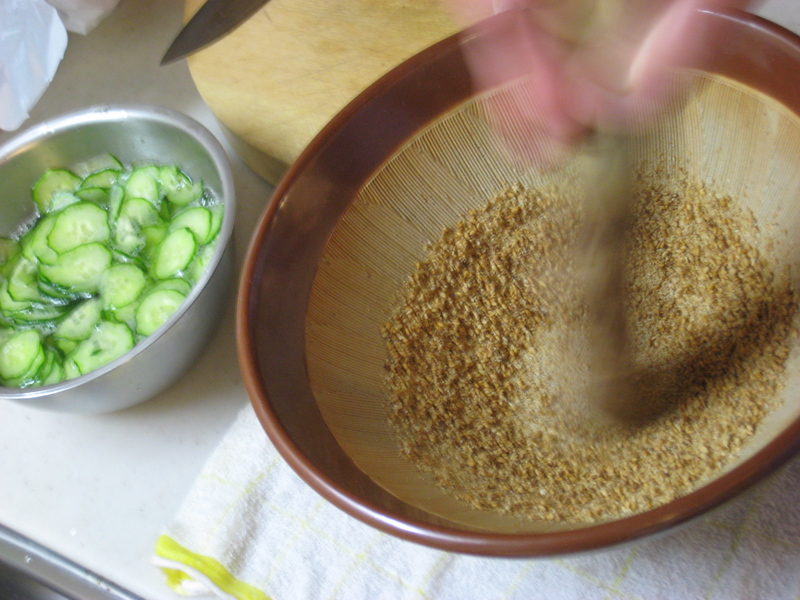 The awasezu can be mixed in the suribachi after you grind the sesame seeds. Yay to less dishes! One of my absolute favorite desserts here in Japan. Note: If you live in Japan, you can purchase black sesame paste. If not, La Fuji Mama has you covered! This sauce is typically used for shabu-shabu but feel free to grill or steam some veggies to just dip in it. One of my favorite condiments and this one is all natural (i.e. no MSG) which is great! The Hamo & Sliced Cucumber dish sound delicious. We’d have to do without the Hamo, maybe use eel or bacon. Joe makes a cucumber side dish that is a recipe from his mother. It isn’t very fancy. I think he may like this. Gwen – I typically omit the hamo/eel/bacon because I forget or don’t have any on hand. It’s just as delicious without! I hope you enjoy it.